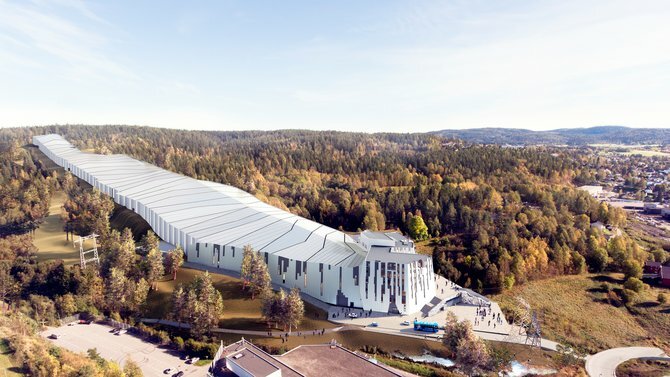 Today, a huge indoor ski hall is built at Lørenskog. The 50,000 square meter building has exterior walls that lend inwardly and costly facade elements of aluminum, polycarbonate, dry stone wall and glass fields. The architect's vision was a melting glacier. "It looks like a glacier melting a bit in the spring," says project manager from Betonmasthæhre Romerike, Erlend Nicolaisen. But how do you actually build an indoor ski resort with a cost of NOK 800 million? 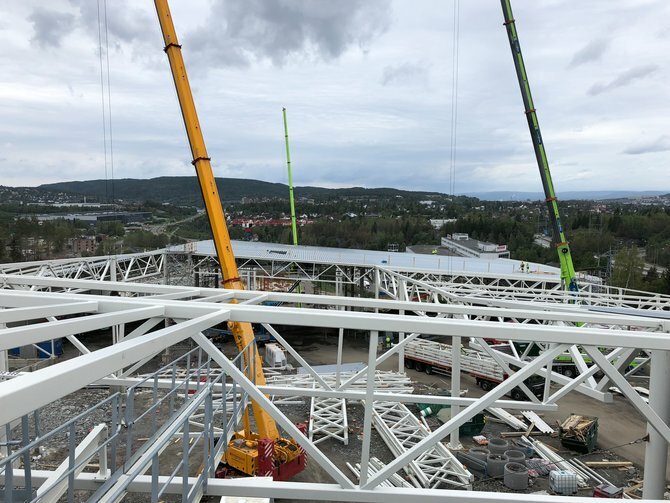 TU Bygg met the project manager in the project's bracket rig to get the status of the 500-meter long building that seems good from the E6 when driving from Oslo to Gardermoen. "Now the hall is about to come up. The goal is to get the roof in place before the new year, says Nicolaisen. Snow is the name the builder The Winter Park has given the project. There is an indoor ski slope with a 500-meter long hill. The plant will have four alpine slopes, chairlift, koppheis and a cross-country ski slope of 1000 meters hanging on the roof. At the bottom of the hill is a commercial building built. "This is a special and courteous project for concrete mast elevation, both in terms of engineering and implementation," explains Nicolaisen. Betonmasthæhre will deliver the building by 31 December 2019. The building has begun in three places at the same time to reach the finish line in a timely manner, says Nicolaisen. "We started at the top, the middle and the bottom at the same time," he says, explaining that it was important to do the most basic work, concrete work, rough construction and roofing in the correct season, "he says. "With this progress, they save a lot of winter costs and looting and raising. And we save the environment with regard to firing, he adds. The construction phase began in November 2017, and the foundation work carried out the sister company Isachsen Anlegg in a working partnership with Betonmasthæhre Romerike. 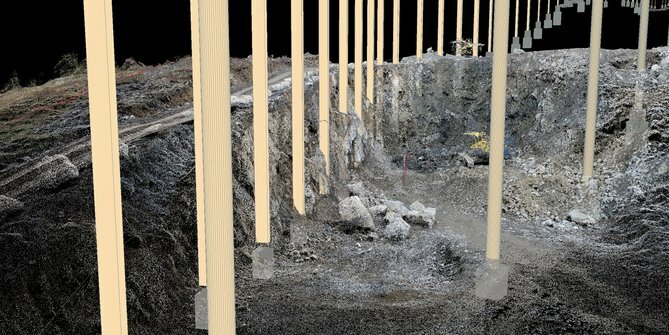 Isachsen uses a lot of drones technology in the project. The building has two zones, one cold and one hot. In the cold zone, which is where the ski resort itself is situated, the terrain has been processed to the finished hill profile. Solvents, clay and mountains have been removed and afterward it has been filled with a cult. Cult are broken fragments of mountains that have many edges so they do not roll. The mountain bites also provide good drainage. Everything is cleaned right down to the mountains. In some places, we had deep gorges with clay, but everything is scraped away. 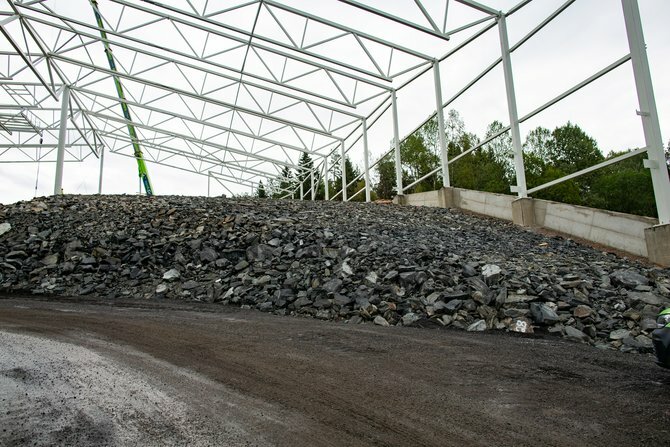 It's also blown a lot, and about 100,000 cubic meters of mountains, and it's filled with cult everywhere, says project manager Nicolaisen, saying that the building has been set up with steel pillars and steelworks from the Finnish company Ruukki. The roof is established with TRP plates, supplied by Ruukki, who has also supplied the other steel structures. TRP have profiled steel sheets that act as load-bearing ceilings. They carry the load loads between the workshops. The entire roof is covered with these plates, and then insulation and roofing are laid over it, explains the project manager. The roof is insulated and covered with foil in three different colors, which will produce the glacier effect, he adds. As on the roof, there are also three different colors on the wall elements. On the outer walls, there will be insulated steel cassettes. On the lower part, there will be an unladen facade with aluminum slabs. It is Borg bygg, which supplies the facade elements from the manufacturer Kingspan, but Nicolaisen says that there are more manufacturers and many types of items with different properties with respect to fire resistance and insulation. He explains that it is mostly the thickness and type of insulation in the core that makes up the difference. Common nicknames on such items are sandwich elements. Common to all types of sandwiches is that they have a surface of lacquered steel, a core of insulation and an inside of lacquered steel. You get the finished exterior wall with surface treatment on both sides of a product, he describes. The running profile is a Canadian company, Ecosign, which has designed. They have designed several resorts around the world, including Norway in Trysil and Hemsedal. Nicolais says that the design of the Canadians resulted in a costly terrain adjustment. Ecosign has designed a great hill that required extensive adjustment of existing terrain. First, it was supposed to follow the hill as it was, but now it must be a steep slope for the survivors. Therefore, we had to shoot down ten meters on a large stretch, he says, explaining that there was an extensive work of explosion that left exposed mountains in the tail. "The mountain cuts had to be secured with bolts and spray concrete," he says. "Here, the builder chose to spend a considerable amount of money to get a good trail profile," he adds. In the bottom of the ground, in what is called a hot zone, it is traditionally built, with steel and prefabricated concrete. It will be a six-story business building that will house the snow company Snø, possibly building contractor Winter Park. Shops related to skiing must have premises in the lower floors of the building. Among other things, Sport1, who is going to hire a ski rental. The Norwegian Ski Federation (NSF) has also booked premises in the building. On the sixth floor, their research department, Sport Science, will be in charge, and here they will train and work on development. This is stated in a meeting protocol from NSF Alpint in the autumn of 2017. It says that there is a "great potential for skiing activity in a commercial hall". It is also clear from the protocol that the Ski Federation shall rent storage space in the ski halls. Another actor to stay in the hot zone is Atomic Pro Center, a competence center for FIS members. They own several brands, including Atomic. They will have a showroom for other store chains that come and select collections. The owners behind the holding company Vinterparken, which owns Snø Oslo AS, are, among other things, Selvaag, which has a shared majority. The company of Stein-Erik Hagen, Canica, owns almost 42 percent, while the Baumann family has a stake of just over eight percent.